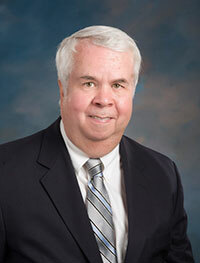 Dr. Robert B. Albertson, known to his students as "Dr. Bob," has taught at Virginia Wesleyan since 1979. Recognized in four recent consecutive editions of "Who's Who Among America's Teachers," his administrative experiences include three years as Coordinator of the Department of Management, Business, and Economics, nine years as Chair of the Division of Social Sciences, and three years as Associate Dean of the College. Off campus, he has been deeply involved in civic and historical organizations. A founding member and second president of the Olde Towne Civic League and later a founder and first president of the Olde Towne Foundation, he authored "Images of America: Portsmouth, Virginia" (now in its third printing and published by South Carolina's Arcada Publishing Company) for his home town%u2019s 250th anniversary. Dr. Albertson was the first recipient of the Emily N. Spong Historic Preservation Award. He has been active with a number local organizations, including the Board of the Multiple Sclerosis Society of Hampton Roads and the "Virginia Beach 2007" commission. As President of The Order of Cape Henry, 1607, Dr. Albertson had a leading part in the 2007 ceremonies commemorating the first landing by the English explorers who sailed from Virginia Beach to found the Jamestown Colony four centuries ago. Although his B.A. was in History, his specialization in Russian studies gave him a foundation in economic theory that served him well when he pursued an M.B.A. and later when he obtained a Ph.D. in Urban Studies. Dr. Albertson's wide range of interests is shown by his election to membership in a number of honor societies, including Phi Alpha Theta (History), Sigma Beta Delta (Business), Pi Alpha Alpha (Public Administration), and Phi Kappa Phi (Academic Excellence). Albertson, Robert. Images of America: Portsmouth, VA. Charleston: Arcadia Press of Charleston, 2002.